04.07.08 Two central Maine scholastic chess players were highlighted in an article that appeared in the Morning Sentinel newspaper on March 27, 2008. Langdon Holly of Waterville and George Spahn of Palermo, both of whom participated in the recent Maine Scholastic Individual Championship, are featured in this interesting read. Morning Sentinel staff photo SERIOUS PLAYER: George Spahn of Palermo eyes his next move while practicing for the Maine State Scholastic Chess Tournament in Orono this Saturday. Staff Photo by Jim Evans CHESS LION: Langdon Holly of Waterville has earned free admission to this Saturday’Äôs Scholastic Individual Chess Championships in Orono after he won three of four games at the team competition earlier this month. Fifth grader George Spahn started playing chess about four years ago, but it was a bad break at age 7 that got him more serious about the game. "I had started (playing) earlier," he said, "but when I broke my arm (chess) was one of the few fun things I could do." George, who attends Palermo Consolidated School, turned the bad break into a breakthrough of sorts. Earlier this month, he won all four of his games in the K-6 division of the Maine State Scholastic Team Chess Tournaments. That performance earned him free entry into Saturday's Maine State Scholastic Individual Chess Tournaments at the University of Maine at Orono. He will be joined there by Langdon Holly, a Waterville boy who attends fifth grade at the Stepping Stones Montessori School in Chelsea. Langdon, 11, also earned free entry into the tournament on the strength of winning three of his four matches in the team championship. Both boys said they are excited about competing in an event that will feature most of the strongest scholastic players in the state. Tournament director Kathy Richards said 13 players in the K-6 division earned a free spot in the individual championship based on their team tournament success. She expects to have a field of about 20 K-6 players Saturday. The high school division typically attracts about twice that number, bringing the total to between 50 and 60 players. 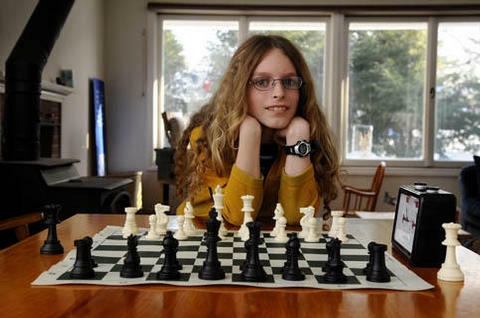 That number pales in comparison to the 251 who competed in this year's team tournaments, an event that Richards said ranks as the state's largest chess competition. But the individual chess championship has its own distinction. "The individuals," she said, "is our most elite (scholastic) tournament." Langdon doesn't find matches stressful. For him the competition is just another opportunity to have fun at a game he enjoys. His mother, Jan Holly, said Langdon learned the game as a kindergarten student from her husband, Charlie. "I think it has always been very intriguing for him," she said. "I think this year he's really taken off as far as ability." George feels the weight of competition more than Langdon. He has high expectations of himself and that's a variable he has to grapple with at tournaments. "There is a lot of like pressure on you that I'm not going to do well," he said, "so I try to stay calm and do my best." In the team tournament, George said he faced an opponent who was nationally ranked. He knew he had to play his best to prevail and, in his mind, that meant taking a risk. "I was really deep into the game," he said, "and I made a sacrifice, but it worked out." George said he sacrificed his knight to expose his opponent's king. The moved proved to be the turning point in the match. "He pulled it out," Martin Spahn, George's father, said. "It was a really long, grueling game." Martin Spahn said his son already beats him and his wife in chess on a regular basis. Win or lose, though, Martin Spahn said he would encourage his son to play the game. "I think chess is really good for kids," he said. "There have been studies that chess builds something called critical thinking, which spills into every academic endeavor." George plans to get up early Saturday so he can have a hearty breakfast before the competition. He's learned that chess success is as much about eating your Wheaties in the morning as it is about sacrificing your knight in the afternoon. "If I don't have a good breakfast," he said, "I get stomach aches and that distracts me, and it is harder to play when I have stomach aches."